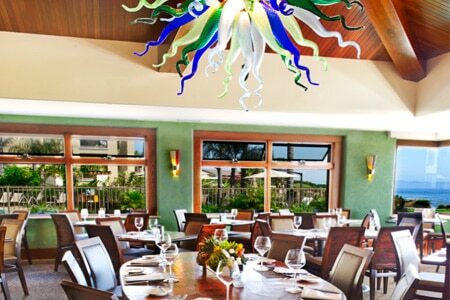 Dine on California cuisine beside the Pacific Ocean. : It’s tough to beat the expansive oceanfront view at Lido Restaurant, whether you enjoy it from the stylish dining room or a seaside al fresco seat on the patio. Inspired by a Mediterranean approach, the menu sports classic dishes with signature touches such as thyme gnocchi, fettuccine carbonara with eggplant, and a filet with smoked tomato whipped potato. Casual options don’t disappoint either, especially the wild mushroom pizza, local grass-fed burger or the steak salad with horseradish crème fraîche dressing. The three-course brunch is a local favorite, as is the weekday happy hour. For dessert, try a house-made seasonal sorbet or go all out with a salted Earl Grey chocolate tart with ice cream. The wine list is well chosen, highlighting both local and global labels and a good by-the-glass line-up. You can also have fresh, from-scratch cocktails.